Two Drifters is ready to cruise. In addition to her original complement of cruising amenities, her current owner has constantly up-graded this vessel during his ownership. 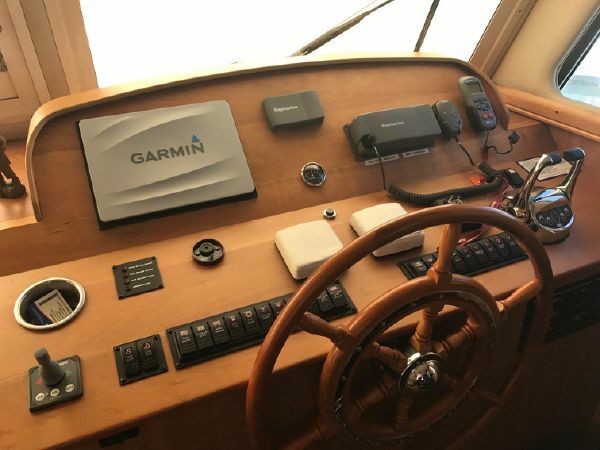 The no longer supported and poor display quality of the original Raymarine electronics have been replaced by a state of the art Garmin electronics network that includes two 7610 chart-plotter displays and one 7612 chart-plotter display, with an integrated fish finder/bottom display. Garmin HD radar and an AIS transponder are also included in this network/upgrade. A new KVH Track Vision TV3 satellite television system was recently installed. The original deteriorating swim platform has been replaced with a custom fiberglass unit. This vessel also has a custom fiberglass hardtop, which provides a significantly cooler flybridge during summertime cruising. New Stratoglass panels make the bridge deck second to none. The air conditioning system is currently being upgraded with a new central unit. She has the preferred 440 hp Yanmar twin diesels and an 8KW Onan generator. The hull and super structure shine like new. Her bottom was recently repainted and the engines serviced. She is ready for you. “Two Drifters” is a 2 stateroom vessel with (1) large head with a bathtub and shower, a main saloon, full galley and upper and lower helms. 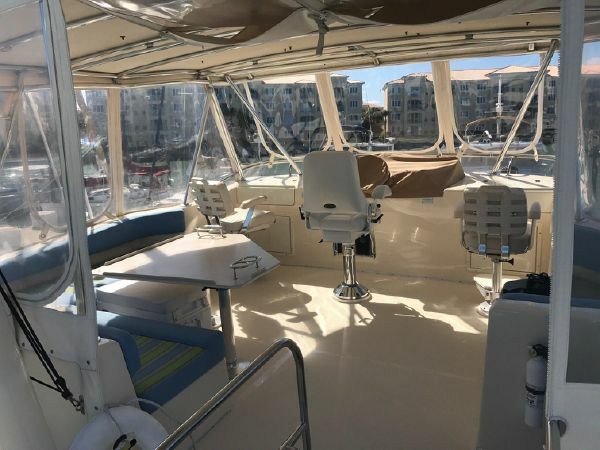 Her fly bridge, with the custom hard top, is huge and is fully equipped with the upper helm, three swivel helm chairs, a triangular shaped table with upholstered bench seating, a four sided full opening enclosure, and a summer kitchen with sink and barbecue grill. Her interior space is truly amazing for a 43 Trawler. Her main salon is both light and airy with opening windows with screens and venetian type blinds on either side, 7 head room and an open floor plan. If you enter the vessel from the swim platform you can either enter the main salon, walk up either side deck or step up to the flybridge. There is a side door on the starboard side at the lower helm. The main salon features a sleeper sofa, a high low table with a leaf and (2) chairs. The inside pilot station is forward of the main salon and to starboard with a Devine Series Captains chair that swivels to become part of the salon seating. Opposite this station is a bar that overlooks the galley. Down three steps is the full galley to port and half way to the forward staterooms is a large dual entry head with a tub and shower. The master stateroom is forward with an island queen berth, two cedar lined hanging lockers, four large drawers and under bed storage. There is a central vacuum system that is housed in this area that extends for use in the salon. The guest stateroom, located amid ships to starboard, functions as a multi-purpose area, including access to a full sized front loading washing machine and 240V dryer. During routine use, the bed is configured as a settee with storage behind for the bedding which can be used when deployed as a full size bed. There is storage under the settee as well. The head is located forward of the galley on the port side and adjacent to the master stateroom. It is accessible by entry doors from both the hallway (for guests) and the master stateroom for the owners. The head features a French shower and bathtub, with two large storage areas above as well as large under counter storage. The salon area features cherry joiner work and opening windows with screens and venetian type blinds on either side. 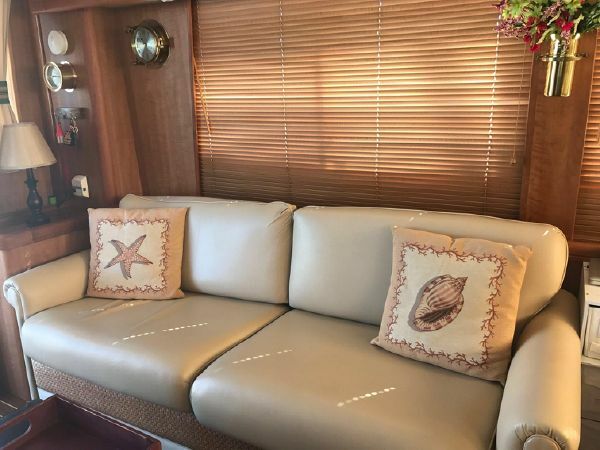 On the port side starting aft is a storage cabinet, then a leatherette sleeper sofa with a coffee table/ottoman. Forward of the sofa is a bar that overlooks the galley area. To starboardand aft is an entertainment cabinet with a 27″ Sole flatscreen TV, with KVH satellite antenna and Direct TV equipment. Forward is a hi-lo table with leaf and two chairs with storage cabinets overhead. There are double glass doors with curtains aft that open to the covered cockpit. The sole is a high gloss vinyl teak and holly with area rugs, while the headliner is a white vinyl. There is a Bose surround sound system wCD and DVD player with bluetooth music streaming and a brass ships clock. There are (13) high intensity/LED overhead and reading lights. The lower helm is forward and to starboard in the salon area. 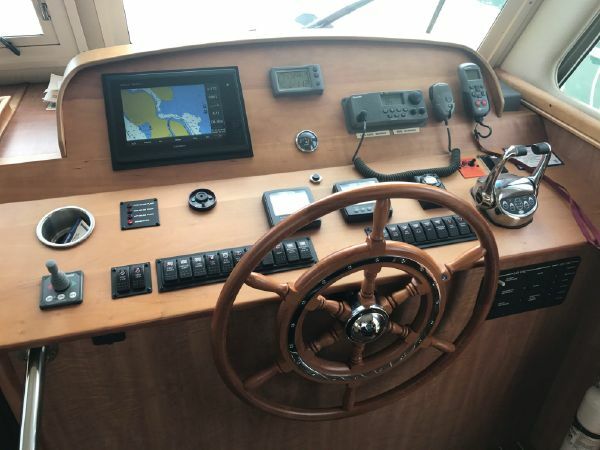 The electronic package has recently been upgraded to include a Garmin 7610 touch screen chart plotter, Garmin HD Radar and an integrated CHIRP depth sounder capability. 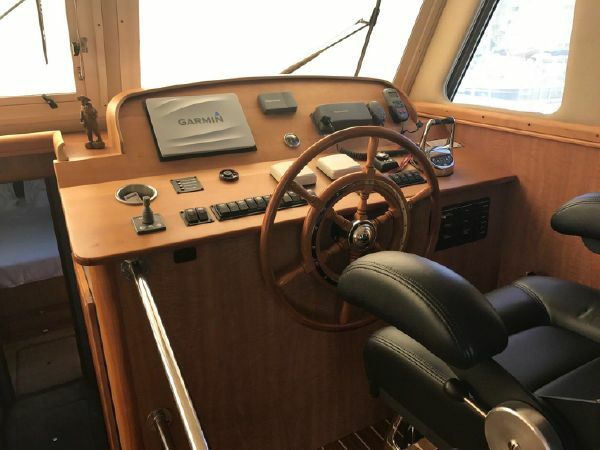 There is a Raymarine ST 802 “Smart Pilot” and Standard Horizon GX 2360 DSC VHF, a Sidepower bow thruster, Glendinning electronic engine controls, Yanmar electronic engine displays, a teak steering wheel, and a Devine Series Captains chair. There is an AIS transponder, a Raymarine ST 40 compass and a full set of boat systems controls. The galley is both open and spacious. It features two Vitrifrigo 120V/24V refrigerator drawers and two Vitrifrigo 120V/24V freezer drawers. There are Corian counter tops, a Princess three burner, glass top, electric range/oven with ventilation hood and a folding cover. There is a Tappan microwave oven, an oversized double stainless steel sink with a designer faucet, overhead cabinets, a dish and cup locker and laminate flooring. 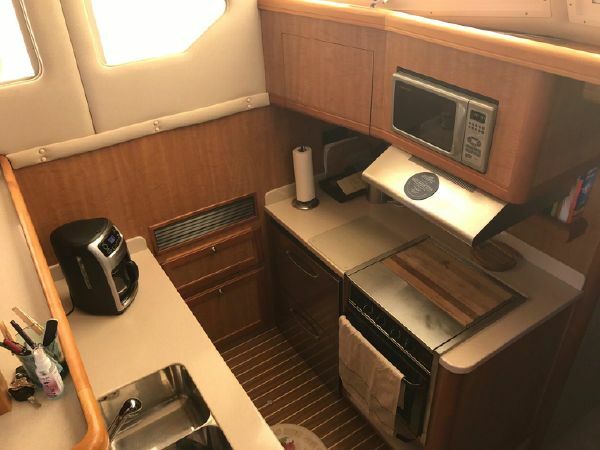 There is additional storage under the galley sole and a large pantry to starboard. This area can function as a guest cabin, office or study. It has a sofa that converts to a full sized bed. There is a double entry door, a desk/end table/ computer table, (2) high intensity lights and a cedar lined hanging locker. There is access to a full sized 240V clothes washer and dryer. There is also access to the underside of the lower helm station for maintenance or repair. There is an opening hatch with sunshade and an opening, screened, stainless steel port light. There is additional storage under and behind the berth. The head is both spacious and airy. It is accessible from both the master stateroom or the midship hallway. There is a full sized tub and shower with a glass enclosure, a built in vanity with Corian counter tops and sink, and a built in linen locker. There is a opening screened port light and a VacuFlush head. There is a 56 gal. poly holding tank with a Y valve for overboard discharge located in the engine room. The master stateroom offers an island queen sized berth with custom bedspread and pillows. There is a cedar lined full length hanging locker with a shoe rack, and an additional cedar lined locker with drawer storage below. 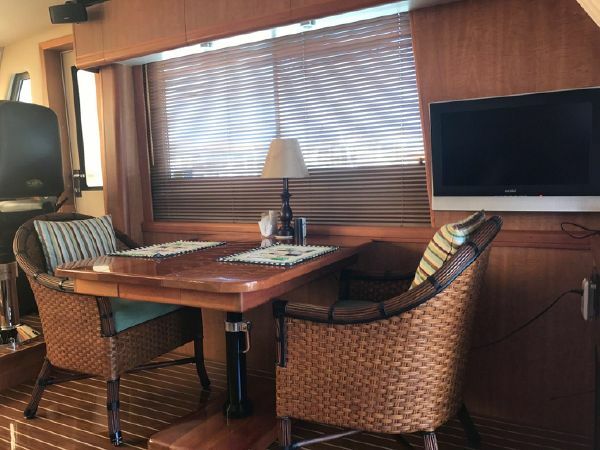 There is a Sole 18″ flatscreen TV, and cherry wood hull side slats. There are high intensity reading lights and overhead lighting. There is storage under the berth and settee. The central vacuum system is housed in this area. There is an opening, screened stainless steel hatch. The flybridge on this vessel is truly amazing. Its perfect underway or for entertaining. You access the flybridge from the aft cockpit steps on the starboard side of the vessel. The visibility from the upper helm is outstanding. There is a Tracy Devine Series Helm Chair centerline with two companion chairs on either side. There are new Garmin 7612 and 7610 touch screen chart plotters with HD Radar and an integrated CHIRP sounder module (currently in use is a non CHIRP transducer). There is a Raymarine ST 8002 auto pilot and 215 DSC VHF, a Sidepower bow thruster controller, Glendinning electronic engine controls, Yanmar electronic engine displays, a Raymarine ST 40 compass and a destroyer type wheel. There is an integrated AIS transponder and a full set of boat systems switches. There is a four sided bridge enclosure that includes three front opening panels. The rear and side panels can be raised as well. To port is an L-shaped upholstered settee that comfortably seats 5-6 around a Corian triangular shaped table. Another upholstered seat is starboard. All have storage underneath. The eyebrow of the flybridge is accessible for dry storage. Aft of the enclosure is the bridge deck that includes a summer galley with a sink, barbecue grill and storage space. There is also a folding mast. Forward is the anchor pulpit w/roller and a 40 lb. “Captains Choice” plowanchor w/200 ft. of 5/16″ G4 galvanized chain. There is an electric Lewmar anchor windlass with controls on the fore deck and at both helms. There is a fresh water wash down. There are (3) Bomar opening deck hatches. The bow rail is 316 stainless steel and the high density rub rail has a stainless steel insert. There are cleats for the bow, stern and spring lines. There is a cockpit fresh water shower with hot and cold water and a dockside water connection. There is a moulded swim platform and a hinged companionway door. There are flush deck water and diesel fills and holding tank access on the port side. There are 50 amp/250 volt AC shore power connections in the anchor pulpit and the aft deck. There is a large transom locker and covered side decks. There are new canvas covers for the windshield and forward side windows.